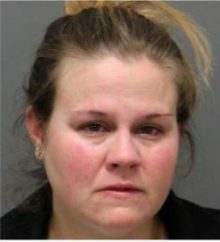 A Wake County Public Schools elementary teacher was arrested and charged with attempting to stab a man according to WRAL. Margarette Duncan Harris, 38, of 604 E. Park St. in Cary, was charged Sunday with assault with a deadly weapon. She was released from the Wake County jail Monday night. Harris stabbed the man who lives at the same address with a steak knife, “slashing his left cheek and the left side of his neck,” the warrant states. She is a kindergarten teacher at Weatherstone Elementary School in Cary. A school district spokesman said no disciplinary action could be taken until she is released from jail. For what it’s worth, Harris apparently teaches kindergarten. Oh, and WCPSS spokesman? Yes, you can take action. Now. According to North Carolina Senate Bill 599, which has been signed into law, the district has options with how to deal with situations like these. Senate Bill 599 stipulates that if the teacher in question is “incarcerated or is in the custody of a local, State, private, or federal correctional facility,” then the superintendent is not required to perform such a meeting before suspending that teacher without pay. Instead, the superintendent can offer written notice of the charges and allow an opportunity for the teacher to respond in writing. Once the teacher is notified of the suspension, the superintendent then has 5 days to either dismiss, demote, or elect for disciplinary suspension without pay. In short, they can suspend this woman now without pay. See past Quiet Epidemic articles chronicling teacher arrests in North Carolina. This entry was posted in CRIME, EDUCATION, Quiet Epidemic and tagged Maragette Duncan Harris, Quiet Epidemic, Wake County Public Schools. Bookmark the permalink.